We would like to wish all the South Indians, Khara Ugadi Shubhakanshalu and to all the Maharashtrians, Gudi padvyachya hardik shbhechcha. In plain English, Happy New Year*! Our New Year is determined by the lunisolar calendar. It is similar to the calendars followed by the Chinese, Buddhists, Mongolian, Hellenic and Koreans. 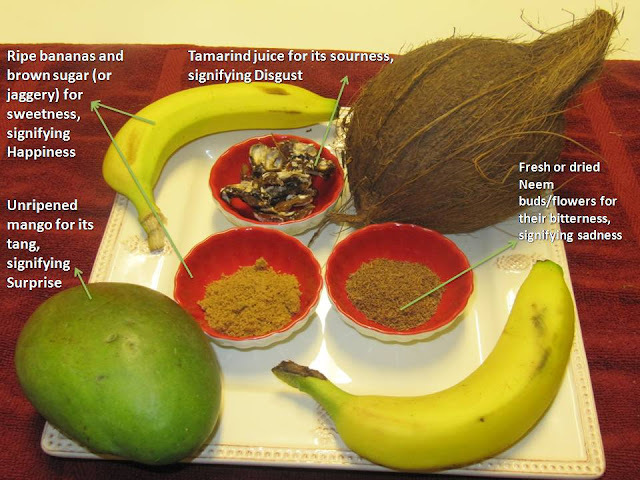 Last year, I remember we posted about some of the dishes that are made on this holiday and forgot to mention the most important one: a special mixture called Ugadi Pachadi (in Telugu) or New Year Chutney (direct English translation). The ingredients from left to right are ripened bananas, tamarind juice (made from soaking dry tamarind in warm water and squeezing the juice out), coconut, dried neem flowers, brown sugar and unripened mango. I heard that people add green chilies and salt too. After these ingredients are combined, we drink it. The significance of these ingredients is that they represent the various experiences we face in the year ahead in equal doses. I didn't realize there was a philosophical meaning...I thought it was a just recipe that was passed down from generation to generation. What a revelation! There are several dishes that are prepared on this holiday. In Andhra Pradesh (my birth state) and Karnataka, people make puran poli, which looks like chappati or roti stuffed with sweet lentil. It is served hot with butter brushed over it. It sounds mouth watering but it's not that healthy. Most temples serve pulihora or tamarind rice on this day. Last year, we went the traditional route and made pulihora and sooji halwa. This year, we kicked it up a notch and made a different kind of pulihora. The main ingredient is an unripened mango which is a bit tangy and a tad sweet. Ooh, I saved the best for last. We also made gajar (carrot) halwa...in the microwave...can you believe it? It came out really well actually. Happy New Year! Wish you the best for 2011.
thanks Avaneesh. We're very excited about it!